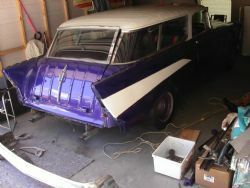 Progress on the 57 Nomad is currently being measured by skun knuckles and the level of cursing coming from the garage. Thankfully there have only been two occasions that warranted a trip to the first aid box due to excessive blood loss and I can still hold a spanner and still believe it is not going to get the better of me. After all the trim and chrome bits came off, the liftgate was the next to go. The alignment on this was atrocious and it will need some serious work from a professional to get it to function, fit and look like it did when the car rolled off the assembly line fifty one years ago. I thought I would look into what was involved by checking out a few forums on other owners that have had dramas with their liftgate (as the Americans call them). Five hours one night on the internet left me blurry eyed and not much wiser so I will have to revisit this in the future. I decided to get all the front panels and doors off next. This would allow me to get a better understanding of the car and what may be required before the paint removal reveals all its dirty secrets. The radiator support and bonnet gave themselves up easily which encouraged me to bat on and get amongst the fenders. Everything was progressing smoothly until the last bolt down beside the front door would not budge. After a good soaking in a product that claims to penetrate rust I gave it another crack. Nothing. Let’s lean on it a little. The nut and half the bolt took off across the garage floor and came to rest in the gutter just outside the garage. Sheared clean off. The other side was déjà vu. This same portion of the fender was sporting copious amounts of bog and will need to be replaced with a lower fender patch panel so the fact that there is a sheared bolt in there may not be a concern. 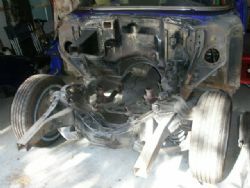 With some hard yards, a bit of jiggling and gentle persuasion the front guards were off and lying on the garage floor. 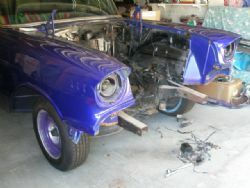 Next up was to remove the inner guards and vent duct. Thankfully this gave in easily and doubled the amount of metal covering the floor. When I first started undoing the bolts inside the guard there was what appeared to be rust falling out of the gaps between the fender and inner fender. I was very suss on what I may find and when they were off I got a good look at what was causing this. Fifty one years of crud had built up in between the two panels and it was part rust and part compressed dirt. 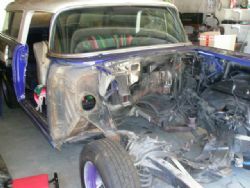 It should come up alright when I get the car garnet blasted but you could tell straight away the fenders had not been pulled off prior to its last coat of paint. Another discovery was the inner fender anti squeak mouldings, or lack thereof. There were about four sections roughly two inches long in a highly perished condition. When I touched them they fell to bits and these had obviously never been replaced. I surmised the front end had never been off the car and from what I can see it appears that it has never had a hit but I won’t fully know until the paint is off. On all 1957 Chevrolet's the fresh air enters the car through a mesh grille that sits above the headlight in the bezel. When I got to take the vent tubing out it also had fifty one years of crud in it and I could have nearly top dressed the back lawn with the amount of fine dirt and debris that spewed out over the garage floor. I learnt from that and took the other side tubing outside and deposited it in the garden. The doors obliged and came off easily and it looks like at some time they have been off before as the bolts holding them on looked like they may have been replaced at some point due to their excellent condition.